Feel safe knowing we are accredited, licensed and insured and have offices in West Palm Beach, Miami, Tallahassee, Pompano Beach, Coral Springs and Fort Lauderdale or we travel to you. American Heart Association Heartsaver Laypeson CPR and AED only (covers layperson adult, child and infant cpr and choking): $70 per person. American Heart Association Heartsaver Layperson CPR, AED and First Aid combo class (covers layperson adult, child and infant cpr and choking and first aid skills): $75 per person. Manual: Training book included at class if you do not have one. Who is this class for? Childcare providers, daycare centers, teachers, coaches, personal trainers, after care workers, some hhc, construction workers, counselors, (this class is not for healthcare professionals...that is called BLS). Commonly asked questions: "Do I have to sign up online?" YES. "I am going to be a nurse, emt or firefighter...is this the class I need?" NO! You need the Healthcare Provider BLS class, that is $80. "Do I have to pay online for all classes?" Your choice. You can pay online through our website or just pay by cash or check when you arrive. "Am I supposed to have my own AHA book?" Yes. 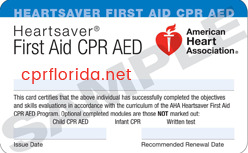 If you forget or don't have one review at www.cprflorida.net/cprreview we also have them at class. "Do I have to do AED (defibrillator) with CPR?" YES! "How long are the classes?" Each class is not exact (number of students, location,etc) so approx. times are: cpr and aed is about 2.5 to 3 hours. CPR, aed and first aid is approx. 4 or more hours. "Do you do free classes? No, we are a busines and this takes time, energy and we have to pay for business supplies and for our instructors time off of work. There are a lot of "free" classes that are not truly free or a scam or just are online. Chose us for a class and training that can not be beat! Take a real class with us and you will learn to be a true lifesaver! You will love that we provide all participants with an upbeat and hands-on educational class, plenty of first aid supplies, aed trainers, your own cpr manikin and even free pens, face shields and cpr keychains for each student! Come to our sites for classes in West Palm Beach, Coral Springs, Pompano Beach, Tallahassee, Miami or Fort Lauderdale, or we can travel to your school, office, business, clinic or home anywhere in FL for private, small or large group trainings.